Central Gear & Machining Specialties, Inc. 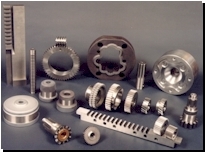 When your needs demand precision gear manufacturing or a full-service machine shop, Central Gear & Machining Specialties is well equipped to meet your exact requirements. Specializing in Worm and Worm Gears, Internal and External Splines, Gear Shaving, Racks, Helical and Spur Gears, Bevel Gears, and Complete Slotting Services. Gear manufacturing from 1" to 100" O.D. Spur and Helical gear hobbing up to 100" O.D. Vertical Slotting up to 12"